Every piece of equipment, large or small, stationary or mobile, indoors or outdoors, needs preventative maintenance. Dirt, debris and grease are continually coating and insulating equipment coils, electronic systems, motors, fins and other components that fall in the path of the equipment’s air intake. Airflow obstructions of any kind are a costly expense. Buildup of dirt impacts equipment’s ability to work efficiently and increases the need for repeated maintenance or equipment replacement. Midwest Air Filter, an air filtration specialist and distributor out of Lansing, Michigan, found this to be the case with their customer at the Jackson National Life facility. 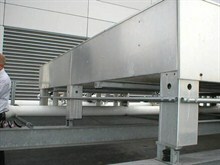 A large office building, containing 1,200 employees, utilizes five rooftop mounted Liebert glycol dry cooler units to take the heat load out of the building and keep the vast computer systems running cool. Maintenance staff complained that these units required cleaning 1-2 times per year, which took up a huge block of man hours and equipment downtime. With an air intake air flow rate of 21,000 to 24,800 CFM, outdoor debris was continually being sucked into the unit and coating the fins and coils. It would take the serviceman a week to get the five machine fins hand brushed clean of debris and then flushed with water in order to keep the coils clean enough to maintain their cooling efficiency. Midwest recommended Permatron’s patented PreVent equipment protection filters to effectively prevent debris from entering the air intakes and eliminate the need for all the hand brushing to clean the fins. Custom designed and manufactured to the equipment’s specifications of 108.5″ x 184″, Permatron sewed vinyl binding with loop velcro to the edges of the 3-dimensional, UV protected electrostatic media. Adhesive backed hook velcro was applied onto the outer, metal walls of the cooler for the filter to be attached into place. A very low resistance to airflow was required, so the serviceman installed horizontal metal supports that the filter was then placed around to allow air space between it and the fins, for increased air flow. PreVent filters are easily cleaned by rinsing in place or using a portable shop vacuum. The polypropylene media is UV protected and contains an inherent electrostatic charge that won’t diminish over time, so it will provide the Jackson National Life facility coolers years of protection. PreVent® the damage before it’s too late!